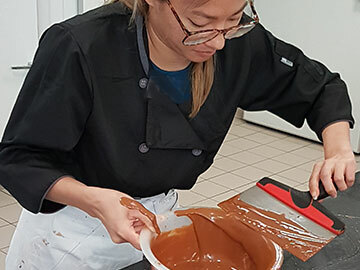 The Professional Chocolatier Program is an intensive part-time program in chocolate making, delivered 100% online over a three-month period, so you can learn without "re-engineering" your work and personal life. 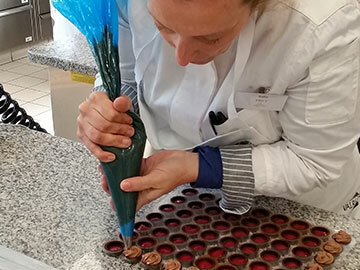 Become a professional chocolatier – learn how to make gourmet chocolate from Ecole Chocolat via your computer, phone or tablet. How do we teach chocolate making online? Our Fall Program starts early in order for students to be finished by the Holidays. You can register and still go on vacation before the end of summer and catch up when you return. and you also have the option of adding the Business Plan for Chocolate Makers program module to build out your business plan. $830.00 US (US & International Residents)/CAD (Canadian Residents – plus GST by province) for the Professional Chocolatier Program PLUS the Business Plan Program at $145.00 – a $50.00 savings. This also allows you another four weeks in the Professional Chocolatier curriculum for extra study and research while you take the Business Plan curriculum. Note: The registration fee does not include ingredients or equipment. These extra supplies could cost approximately $200 US depending on what small equipment you already own. When is the Professional Chocolatier Program offered during the year? We offer sessions of the program starting in January, March and August each year. 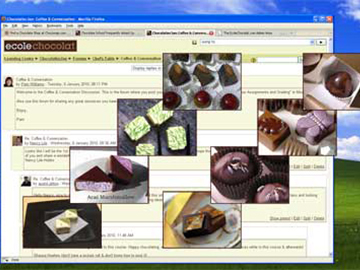 Develop a shopping list of chocolate-making suppliers for all ingredients and equipment. Research chocolate crystallization and practice tempering techniques – the building blocks of chocolate work. Understand the chemistry of chocolate in order to create successful chocolate recipes. Learn modern decorating techniques and experiment in preparation for recipe development. Learn and practice working with chocolate (including chocolate tempering, dipping, decorating and molding). Produce a number of chocolate recipes such as chocolate truffles and other bonbons (filled chocolates). Developing a "plan of action"
Source your ingredients, equipment and packaging so you'll know the suppliers available to you. Understand how to set up your operation to maximize production, efficiency and profitability. Identify market need in order to position your products successfully for your target market. What you can accomplish during the program. The left group of photos are images posted by our students during the program, showing the level of skill they obtained. While photos are not required to be graded on technique work, we do encourage students to share any photos they do have with their classmates. The right group of photos are images of different types of production and presentation techniques, such as molded, hand-dipped and enrobed, from our graduates' websites. Our graduates' success during the program is our success. Click here to learn more about our graduates! EC Graduate Alexandra Clark talks about starting her business in the embedded video. You can cancel from the Professional Chocolatier Program up to three days before the start of the program. A refund of your registration fee, minus a 10% administration fee, may take approximately 10 working days to process. Because our programs are usually full, and in order to make sure all students are committed, on the start date of your program your registration fee becomes non-refundable and non-transferable to another session (except in extraordinary circumstances).